Emily Washines, photographed on the restored flood plain of Toppenish Creek, where she filmed her documentary, Return of the Wapato. Washines chose traditional dress to emphasize the Yakamas’ historical connection to this landscape. As autumn sun glinted off Mount Adams to the west, Emily Washines MPA ’10 stood in the middle of a freshwater stream in the heart of a restored wetland, and smiled. Wearing wading boots decorated with tribal motifs, she gestured to a side channel off Toppenish Creek, which flows through tule reeds along the northern edge of the Yakama Reservation in south-central Washington. was wapato (sagitarria latifolia), a small edible tuber known as an Indian potato, and traditionally an integral part of a Yakama “first foods” menu. Wapato had largely disappeared from the local diet over the last century, as wheat farmers drained wetlands and industrial agriculture expanded over the reservation. When a 430-acre wheat farm adjoining the reservation came up for sale in 1993, Yakama Nation biologists saw a chance to restore once-lush riparian habitat and help struggling Columbia River steelhead, upon which the Yakama depend for sustenance and livelihood. The biologists turned to the knowledge of tribal elders to accomplish the work. They advised allowing beavers to return and using local basalt to restore the channels of the ancient floodplain. The biologists hoped that with a healthier ecosystem, anadromous fish and other wildlife would flourish. They hadn’t counted on the return of the wapato, once widely consumed by indigenous people throughout the Americas, and thought to be lost from the lands of the Yakama Nation. Washines’ short video, Return of the Wapato, was created on this landscape, where the Yakama have lived for thousands of years. She wrote, shot, and produced the video for her Evergreen MPA capstone, inspired by her husband, tribal archaeologist Jon Shellenburger, who regularly drove her across the Cascades to Evergreen and waited outside with their infant daughter Alice while Washines was in class. Using beaded figures and tribal wisdom, the video tells a story of finding the wapato again on the restored floodplain of Toppenish Creek. With reverence for the tradition of wild foods, Washines filmed herself in hip-boots, using her feet to dislodge wapato from the creek bed and joyfully retrieving the tubers as they floated to the surface. Baby Alice is there too, in a beaded buckboard, present as her mother reclaims this first food for herself and her people. Alice is now eight years old, and Washines has two other children, as well as more videos and poetry to her name. She credits Return of the Wapato, however, with opening professional doors and connecting her to other indigenous people around the world. 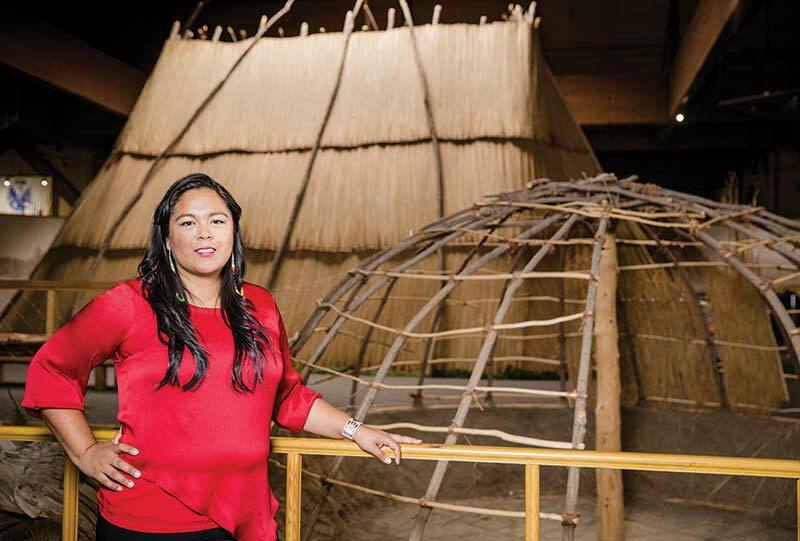 Emily Washines’ various roles with the Yakama Nation help her connect culture and community. Here, she’s photographed at the Yakama Nation Museum and Cultural Heritage Center. She cites the instrumental influence of two Evergreen faculty, Alan Parker and Linda Moon Stumpff, who together created the nation’s first MPA in tribal management. Washines now works as a public information specialist with Yakama Nation Fisheries, is president of a local environmental nonprofit, and was recently appointed by Washington Governor Jay Inslee to serve on the board of trustees at Central Washington University. She’s also running her own start-up, Native Friends, which she describes as a Native lifestyle empowerment business, offering language, history, and parenting resources. The Yakima Indian War of 1855–59 is a current focus for Washines. That war, in which her ancestors fought, drew in many Northwest tribes as well as federal, state, and local militias, and saw massacres and atrocities on all sides. 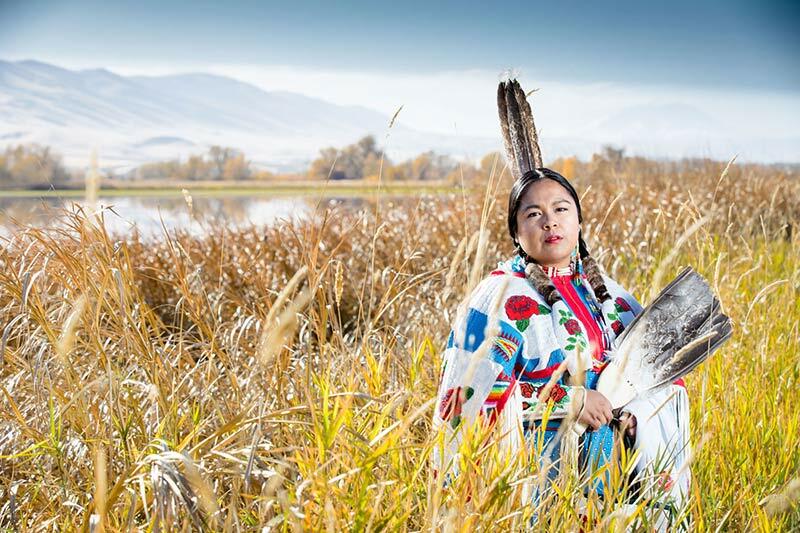 Her video, Yakama War, Ayat (Woman), is partly narrated in the Yakama language with English subtitles. Funded with an artist development grant from Evergreen’s Longhouse Education and Cultural Center, it tells the story of the war from a woman’s perspective. Washines is also working on a connected book of poetry, Yakama Ayat. In her research, Washines tracked down and interviewed white descendants of the commanders and soldiers who fought the Yakama across the sagebrush steppe of the Columbia Plateau. “Many of those families still hold stories about their militia ancestors who came from the Dalles to kill Indians,” said Washines. “They would hunt all day, and turn back at dusk, only to hear the sounds of Yakama warriors laughing at them, echoing through the hills. Washines’ special hope is to talk to descendants of Major Granville Haller, who was defeated by Chief Kamiakin of the Yakama in the Battle of Toppenish Creek in 1855. Haller later commanded Union forces at the Civil War Battle of Gettysburg. 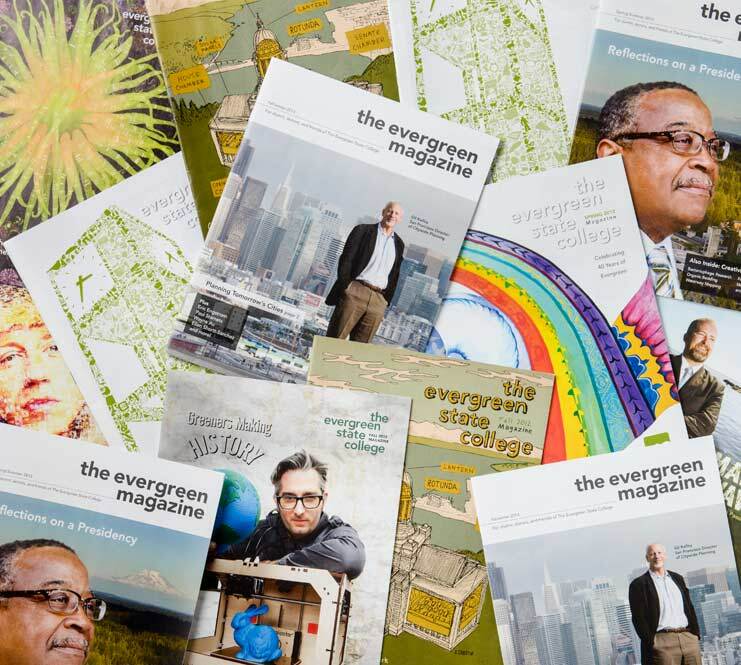 View the film, Return of the Wapato, at evergreen.edu/washines-film.